Grab your friends and family for a scavenger hunt to explore downtown Clermont in the best way possible-by bike of course! 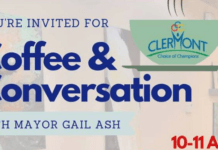 Teams of 2-4 people will discover unique local businesses and interesting details about the City of Clermont. Start and Finish the ride at Waterfront Park with music prizes and lots of fun. Come get some exercise, enjoy the outdoors, and see some historical and scenic views.